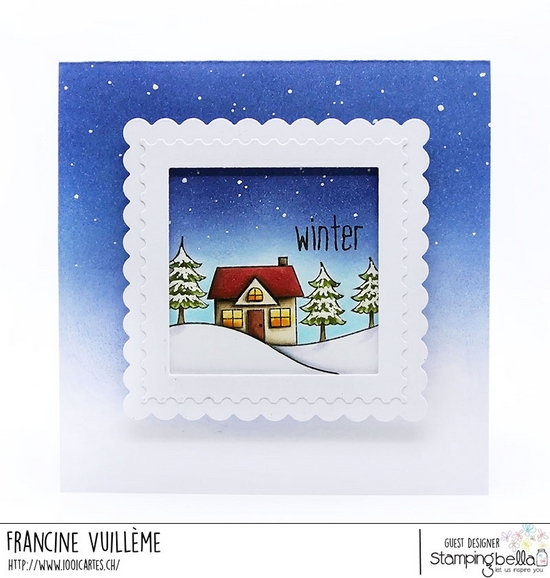 I decided to use the wonderful Winter Backdrop stamp as a main and focal image. I first made a top-folded card base from white cardstock. I sponged the top of the card front with blue Distress inks to get a beautiful gradient from blue to white. I then stamped the image on white cardstock, colored it, created a gradient for the sky using Distress inks and blending tools too and cut around to get a square image. I die cut two scalloped frames from white cardstock that I glued on top of each other and attached the square image behind the frames. It looks a bit like a postage stamp, right? I fixed the frame to the sponged card front with foam pads for more dimension. Did you see January’s stamp of the month? It’s the Winter Backdrop stamp I used on my card! That means: 25% off, all month long! Yay! Don’t miss the offer! If you want to get the stamp, it’s now or never LOL! It’s all for me now! I enjoyed playing with these fabulous stamps. Thanks to Emily for having me as a guest and for being so generous! See you soon! Such a clever way to use the backdrop stamp - LOVE it!! Jede Karte ein kleines Wunderwerk, du hast ein sagenhaftes Talent!! Oh my ! What a fantastic card ! That’s a gorgeous winter scene. Gorgeous winter wonderland, Francine! 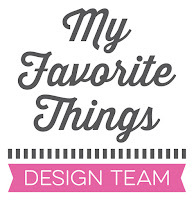 Your gradient sponging in the background is gorgeous and blends perfectly with your focal point! Love your layered scalloped frame, too!